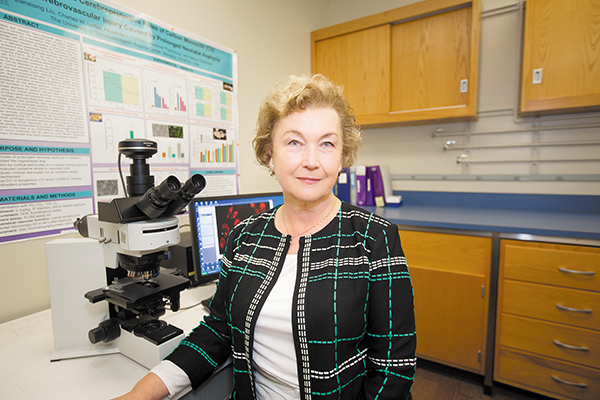 Helena Parfenova, PhD, professor of Physiology in the College of Medicine at the University of Tennessee Health Science Center (UTHSC), has been awarded a $2.1 million grant to further study the functions and mechanisms behind neonatal seizures, and to potentially uncover naturally-occurring defensive mechanisms to prevent cerebrovascular disease in newborns. The neonatal brain is vulnerable to compromises in its blood supply because of its rapid development of neurons, and seizures are the most frequent abnormal neurological event in newborns. Neonatal cerebrovascular disease caused by oxidative stress during seizures, hypoxia/asphyxia, and ischemia can lead to debilitating and lifelong neurological complications. Presently, there is no effective treatment to prevent neurovascular dysfunction triggered by neonatal seizures. "Brain oxidative stress is the main component of neurovascular damage caused by seizures, and endothelial cells are key elements of the neurovascular unit," Parfenova said. "Strengthening antioxidant mechanisms in the neonatal brain can prevent endothelial cell damage during oxidative stress conditions." Parfenova is specifically focusing on a novel gaseous mediator, carbon monoxide (CO), which is naturally produced in the brain. In small amounts, carbon monoxide has proven to be a vital part of antioxidant defense mechanisms that promote endothelial cell survival in newborn brains. "Our preliminary studies show that while head cooling does not stop seizures, it has proven to help reduce brain oxidative stress, prevent neonatal cerebrovascular disease, and protect blood-brain barrier integrity," she said. "We want to uncover the phenomenon and key players by which this positive defensive reaction occurs."